We are an all-volunteer group dedicated to supporting the efforts of Northern Colorado’s backyard and community food gardeners through workshops, the seed-swap, the starter-barter, and by promoting local food growing events. Veggie, fruit, flower, and herb starts will be available for sale, barter and trade. 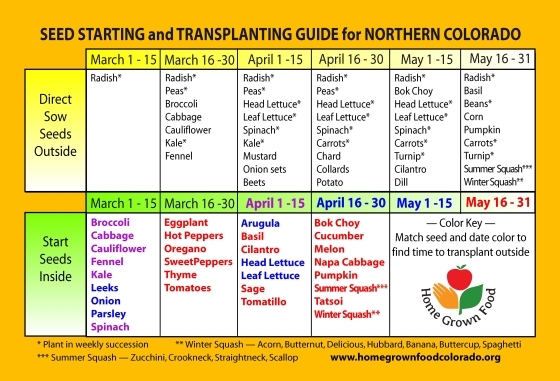 Check out our essential Zone 5 seed starting / sowing / transplanting calendar. Put it on your fridge, you’ll be lost without it. Designed and created by our member Robert Howard. Click here or on the image above to download the PDF version. To inspire individuals to develop & sustain organic food-producing gardens in backyards and on private or public land... & to build competence, community & joy while doing it! In the interest of keeping backyard food-growing affordable in early May we hold our Starter Barter & Plant Sale. No-Dig, Lasagna, Compost…. whatever you call it, this is an excellent way of creating thick humus-laden, water retaining, nutrient-rich, organic soil for your vegetables. There is no fee, everyone is welcome. Fill out our membership form, or e-mail us with questions or for more information.